Significant expertise with diamond mining and operations. Active cash flow operations at Letšeng Mine (Lesotho). 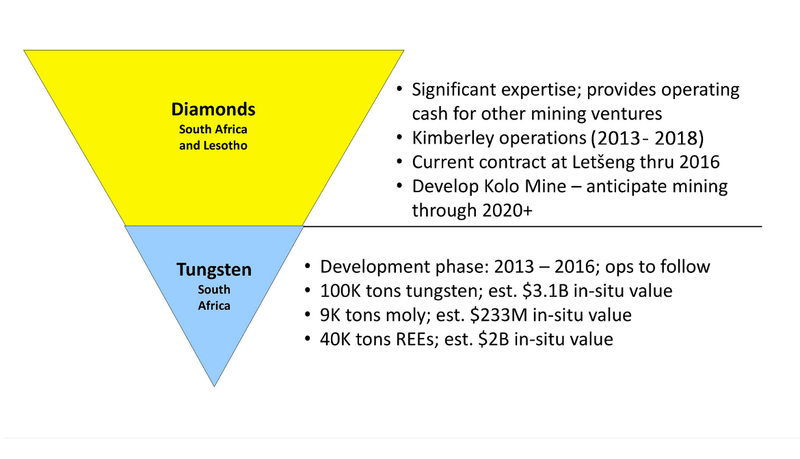 Kolo Diamond Mine (Lesotho) under development. Trial mining begins 2015. Exploration rights received in 2011. Prospecting program began in March 2012 and stopped in late 2012. An interim report was produced by SRK based on current and historic data (April 2013). Learn more about our diamond projects. Learn more about our resource development projects. Batla buys out Emu's 50% share. Extended issues regarding legal ownership by previous leaseholders. Lesotho Appeals Court declared free-and-clear ownership in April 2013. Site-development in progress to facilitate the beginning of trial mining in early 2015. Project to be the 11th largest deposit in the world. Bongani Minerals (effective control by Batla) received prospecting right July 1, 2011 for tungsten, molybdenum, rare earths, copper, zinc, silver and gold. Re-testing of select core drill data from 30+ years ago indecates 80% validation of historic data. Access historic Anglo data to determine exploration spend and optimize development approach.